This is a specialty washdown hose with a high temperature chlorobutyl tube for users who are accustomed to using a premium, historic, wrapped cover washdown hose and are looking for an alternate option to the traditional Strahman hose. It is a surprisingly durable, lightweight hose with a specially compounded chlorobutyl rubber tube which provides added resistance to heat aging and certain chemicals. The tube is NOT designed to transfer food products. It is available in several colours/cover compounds: Black or Red Neoprene (resistant to weathering, moderate oils, non-oxidizing acids, chemicals, solvents) or White Hypalon (similar to Neoprene but some additional resistance to non-oxidizing acids, but only fair resistance to oils). SPECIAL NOTE: this hose is made of cholorobutyl, neoprene, or hypalon rubber compounds that may not be suitable for use with certain cleaning chemicals, solvents, detergents or sanitizers; such solutions can have an adverse affect on the hose, resulting in reduced service life or failure. Ensure compatibility by referring to the manufacturer chemical resistance chart. Inspect hose before each use. Typical Fittings: N400L long Brass Barbs (higher temp/PSI), N511/512 Long shank brass GHT ends, N2280 stainless hose swivels, stainless crimp sleeves, punch clamps. For HOT water applications long shank/long barb fittings are required. If using cleaning chemicals or sanitizers, always confirm if they are compatible with the nitrile rubber compounds of this hose. Construction: Tube: Smooth, black Chlorobutyl rubber. 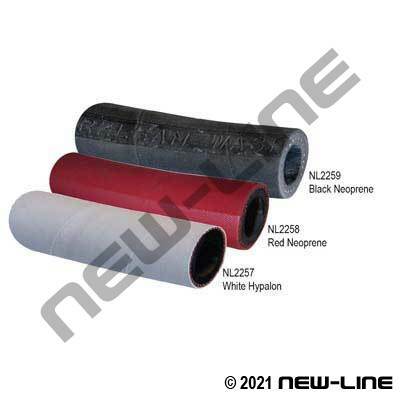 Cover: NL2257 White, wrapped Hypalon; NL2258 Red, wrapped Neoprene; NL2259 Black, wrapped Neoprene. Reinforcement: Single Rayon Textile braid.